Measure H, supported by nearly 70% of the County’s voters, will generate $355 million annually for the next ten years to house people experiencing homelessness. The goal for the first five years is to move 45,000 individuals living on the street into homes and prevent another 30,000 individuals from falling into homelessness. The 1/4 cent sales tax that will be used to fund Measure H takes effect on October 1, 2017. 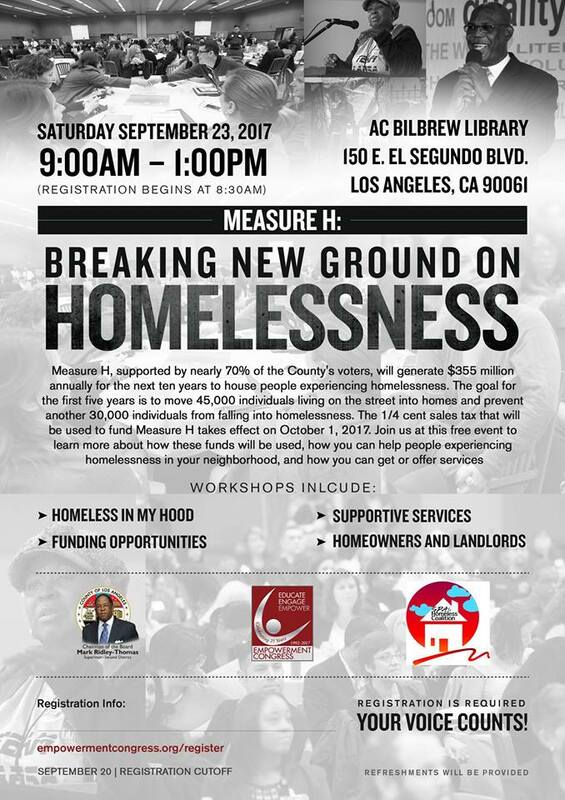 Join us at this free event to learn more about how these funds will be used, how you can help people experiencing homelessness in your neighborhood, and how you can get or offer services.